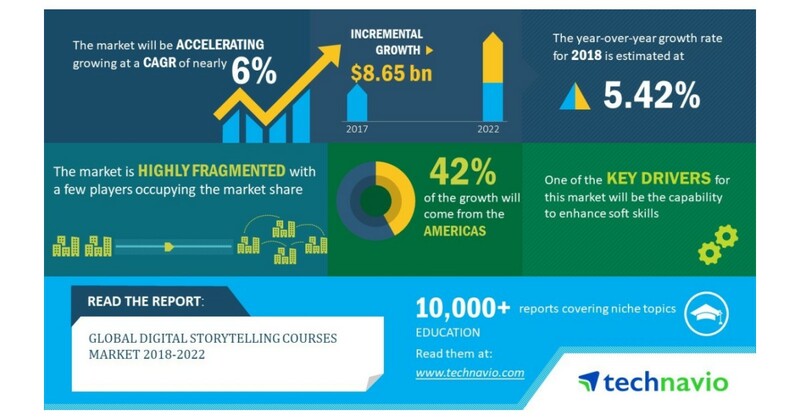 LONDON–(BUSINESS WIRE)–Technavio analysts forecast the global digital storytelling courses market to grow at a CAGR of more than 6% during the forecast period, according to their latest market research report. The increased focus on digital marketing by companies is one of the major trends being witnessed in the global digital storytelling courses market 2018-2022. Digital marketing involves the advertisement of products or services using digital technologies, largely on the internet, and includes smartphones and digital mediums. Thus, the usage of digital marketing has encouraged companies to use digital storytelling as a medium for marketing. The storytelling course is the modern version of the traditional storytelling technique. The storytelling courses teach the participants about the art of expressing their thoughts in the form of stories, thereby increasing their skills associated with the soft skills. The global digital storytelling courses market research report provides market segmentation by end-user (individual learner and institutional learner) and by region (the Americas, EMEA, and APAC). It provides an in-depth analysis of the prominent factors influencing the market, including drivers, opportunities, trends, and industry-specific challenges. The institutional learner segment held the largest market share in 2017, contributing to over 63% of the market. The growth of the segment can be attributed to the increased deployment of these courses in the Pre-K-12 and K-12 education. The Americas held the largest share of the market in 2017, accounting for close to 42% share, followed by EMEA and APAC respectively. APAC will experience increased adoption of storytelling courses, owing to the rise in adoption of technology in education and deployment of digital storytelling in the pre-schools.